One of the couples in our church celebrated their 65th wedding anniversary this year. Even as I type this, I have a hard time comprehending the longevity of their marriage. Sixty-five years is a long time. By any standard it’s quite an accomplishment. Very few marriages last that long. In fact, fewer and fewer marriages seem to be lasting at all. In the past month alone I have counseled with two different women who were struggling in their marriage. In both cases, the husband and wife were Christians. And in both cases, their marriage was falling apart. Each woman had similar complaints. They did not talk anymore. They felt like they were living separate lives under the same roof. And the love and respect in the marriage was gone. Communication plays a major role in marriage. Without it marriages fail. Likewise, without healthy communication marriages will fail as well. Each problem in the above example was a communication issue. They might have communicated with each other to an extent, but it was an unhealthy form of communication. They lacked proper communication in their words, in behavior, and in attitude. Or, you could say the problem was in the things they said, the things they did, and the things they thought. To have a healthy, godly marriage it is vital that we understand healthy communication. 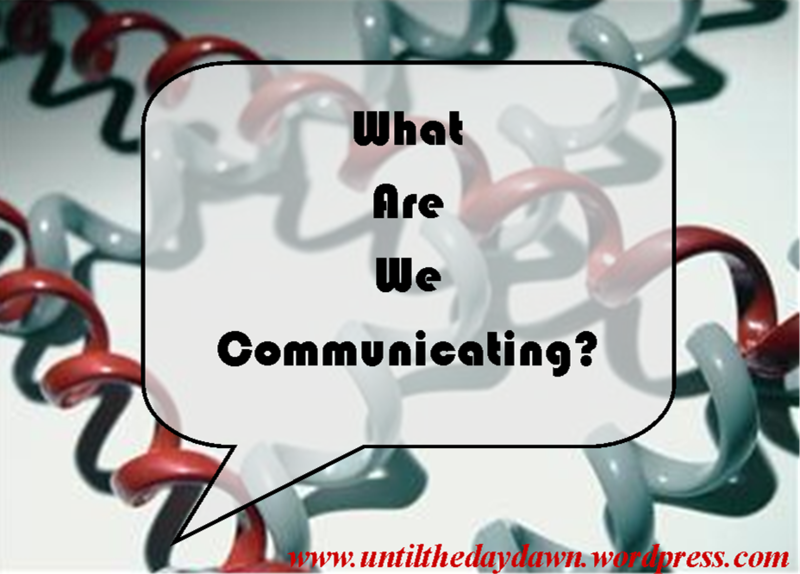 Merriam-Webster’s dictionary gives the definition of communication as “a process by which information is exchanged between individuals through a common system of symbols, signs, or behavior.” Communication is more than talking. It is expressing yourself through words and actions. It is articulating clearly the thoughts of your heart. A husband can communicate to his wife that she is not important by his words. When a wife ignores the requests of her husband she communicates to him through her actions that she doesn’t respect him. Or, through positive, loving actions she can communicate great respect. It is important to remember that communication is always two-sided. Let me ask this. Which blade on a pair of scissors is the most important? Communication is like this. It takes both sides to accomplish anything. Healthy communication is the conduit Christian couples use to build strong, godly marriages. While communication comes in all forms, there is no stronger form of communication than the words we say. Proverbs 18:21 declares that, “Death and life are in the power of the tongue.” Our words can be used for great evil or great good. Our words can tear down or they can build up. Wives are warned in Scripture that “Every wise woman buildeth her house: but the foolish plucketh it down with her hands,” Proverbs 14:1. And Jesus warns that “every idle word that men shall speak, they shall give account thereof in the day of judgment,” Matthew 12:36. More marriages have been destroyed by careless words than perhaps any other thing. In the book of James we are given three illustrations of the power of our tongue. The tongue is like a bit we put in a horse’s mouth that controls the whole horse. It is like a “very small helm” (rudder or wheel) that controls a large ship. And it is compared to a spark of fire. (James 3:3-6) It is small in size, but large in nature. The passage continues to say, “But the tongue can no man tame; it is an unruly evil, full of deadly poison,” James 3:8. It is true. No man can tame the tongue. Have you ever heard these words? Have you ever said them? No, we cannot control our tongue. It is impossible, for out of the abundance of the heart man speaks. However, the good news for us is that God can and does control the words of his children. “A good man out of the good treasure of his heart bringeth forth that which is good,” Luke 6:45. As children of God we have two options. We can choose to walk in the flesh, fulfilling our own selfish desires. But be warned, if we choose this path our marriages will be filled with envying and strife (James 3:14-16). Or, we can walk in the Spirit with the wisdom of God. “But the wisdom that is from above is first pure, then peaceable, gentle, and easy to be intreated, full of mercy and good fruits, without partiality, and without hypocrisy,” James 3:17. The method we choose will help to determine the outcome of our marriage. We have seen that healthy communication is essential to a strong, biblical marriage, but it is not enough. To have a successful marriage we must have the proper motivation. What motivates you as a wife? What motivates you as a husband? Do you want a good marriage for the sake of your children? Do you want a good marriage so you can be happy? Is your desire in marriage centered on selfish motives? These questions need to be asked. I have heard it said that one of the biggest problems we make is making marriage about “me” instead of “we.” This is a good point. Most problems, including a lack of communication, stem from selfishness. But, for the Christian, I will go even further. To have a true, biblical marriage our focus should not be on “we” but on “He”. For the Christian couple, Jesus Christ should be our motivation behind having a strong, biblical marriage. Wives submit to your husband (verse 22). Husbands love your wives (verse 25). The husband and wife is no longer two, but one flesh (verse 31). Then, in the next verse, God gives the motivation behind marriage. “This is a great mystery: but I speak concerning Christ and the church,” Ephesians 5:32. Your marriage here on earth is a picture of the heavenly marriage between the Lord and His bride. When Christian couples have unhealthy, failing marriages they are depicting to the world a distorted picture of Christ and His church. Wives are to submit to their husbands “as unto the Lord.” It’s all about Him! Husbands are to love their wives, “even as Christ also loved the church, and gave himself for it.” It’s all about Him! When we view our marriage in light of the testimony we are giving to the unsaved world, it greatly motivates us to have a God-pleasing marriage. You see, once again communication plays a vital role in marriage. Every marriage is communicating something to the world. Dear Christian couple, just what is your marriage communicating to those around you? Healthy communication is designed to build and strengthen the godly marriage. In turn, a godly marriage illustrates to the world a beautiful picture of the perfect heavenly marriage. In both, God receives all the honor and glory. Communication – yes, yes, yes. Also- dont go into marriage with a game-change plan. You can’t change anyone, and if you don’t like this or that before you get married – it will only exacerbate after marriage. People can only change if they want to, and then only through the power of the Holy Spirit. A thoughtless man will not become thoughtful just because you are married. And a complaining woman will not suddenly transform after the I dos either. Very well said! Thanks so much for your thoughts. Blessings!